The last two of my favorite self-stripers hold their own with creative color combos that always look good to me. Take sknitches for example. Yes, I am clearly a fan of blue and brown, but don’t these socks look so good? Sknitches also has a wide array of non-striping yarn in beautiful colorways, so if you order from her site, you can get a great mix of sock yarns in fabulous colors. 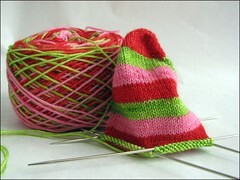 Some of the first handmade self-striping yarn that I ever heard about was Vesper sock yarn. As a spinner, the shop’s curator also has a beautiful assortment of hand-dyed roving. It can still be kind of a challenge to snag the sock yarn, but it seems like there are shop updates many Wednesdays, and the Ravelry Group can a be a useful guide to shop stalking. Speaking of ravelry groups…. 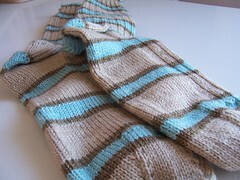 a long time ago I started a Ravelry group for those that love stripes – Better with stripes. Pop on over and say ‘Hi’ if self-striping yarn is your sort of thing. 4 Responses to "Socktober – Self striping yarns Part II"
Gorgeous! I’ve always wanted some Sknitches, but have never been able to get my hands on some. Sknitches is really cool. I have two skeins of Julia’s sock yarn in my stash that I was eyeing this morning, actually. Wow- those are some gorgeous self striping yarns! I guess I hadn’t really spent much time thinking about self striping yarn because the typical colorways and fine stripes really aren’t me. These wide stripes are fabulous!